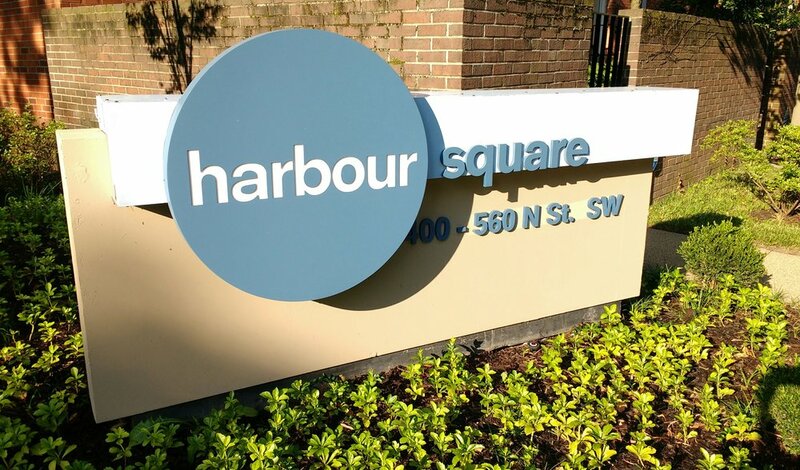 Harbour Square features modern architecture that melds seamlessly with eighteenth century row houses listed in the National Register of Historic Places. 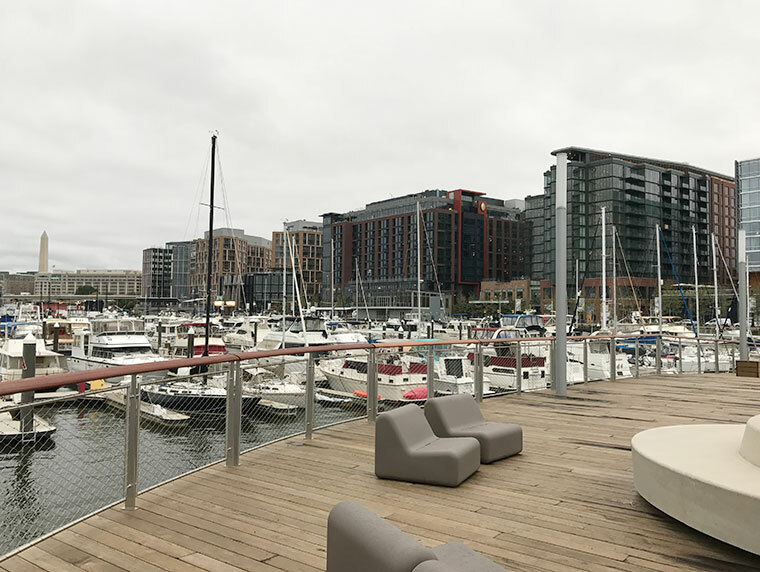 Since the 1960s, this gracious blend of historic and modern aesthetics has attracted numerous prominent Washingtonians to call Harbour Square home. Harbour Square’s most noted early residents were Vice President Hubert H. Humphrey and his wife Muriel who moved here in October 1966. According to news reports, during the 1968 presidential campaign Humphrey told friends that, if elected, he and his wife had no intention of moving out of Harbour Square to live in the White House. Built between 1963 and 1966, Harbour Square marked the beginning of Washington’s recognition as an incubator of first-rate architectural talent in the face of previous disrespect and skepticism. Its construction was a significant step in the redevelopment of Southwest Washington with its highly innovative design, mixed housing types, and effective use of green space. From its inception, the design of Harbour Square took particular and deliberate advantage of its riverfront location, and leveraged the advantages of this location with a subtle interplay of design elements. Its integration of Wheat Row, as well as Barney and Lewis Houses, represents an early effort to adaptively reuse historic buildings and make them a functional component of a new development. 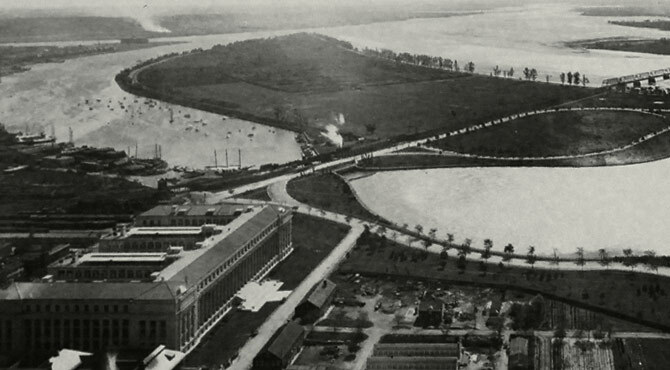 Southwest Waterfront is the only residential neighborhood west of the Anacostia River in Southwest, the smallest of Washington’s four quadrants. 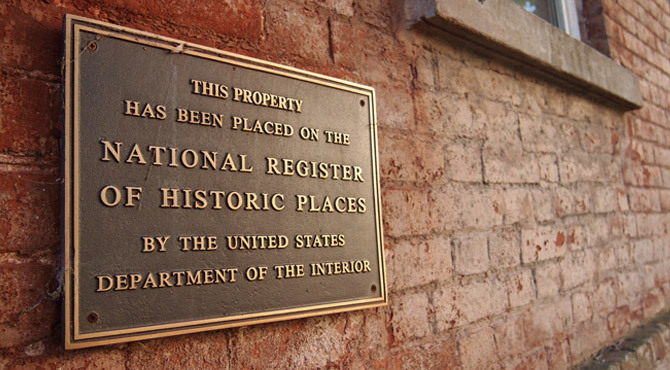 The neighborhood is part of Pierre L’Enfant’s original city plans and is home to some of the oldest buildings in the city, including the Wheat Row block of townhouses built in 1793. In the 1950s, city planners worked with Congress to implement a plan of significant urban renewal. Harbour Square was a cornerstone of the mid-century renewal effort and now is noted as an elegant residential oasis in this vibrant neighborhood that continues to evolve on the water’s edge. Chloethiel Woodard Smith (1910-1992) was the architect of Harbour Square and one of the first women to become a fellow in the American Institute of Architects. The intersection of Connecticut Avenue and L Streets NW gained the nickname “Chloethiel’s Corner” because she designed the prominent office towers on three of its corners. 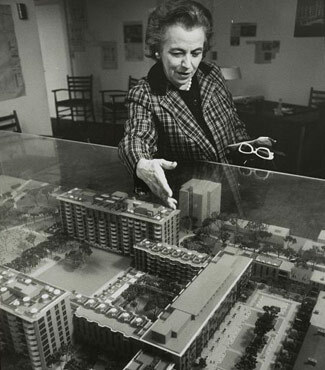 Look Magazine dubbed Smith the “Leading Lady in Urban Renewal” and published a photograph of her examining a scale model of Harbour Square. Smith’s Capital Park project was listed on the National Register of Historic Places in 2002, and Harbour Square was nominated for this designation in 2011. Smith partnered with landscape architect Daniel Urban Kiley (1912-2004) to create Harbour Square’s open spaces. Kiley’s landscape achieves a synergy with Smith’s extensive use of glass windows and balconies. His design creates shifting planes within the complex that draw one’s eye out to the Washington Channel. It includes classic Kiley features such as a grid of maple trees in the Entrance Garden and an allée of flowering trees. The one-acre aquatic garden and island planted with a willow tree provide unity to the complex, linking it to the river, as well as reflecting the sky. At the other extreme are the roof gardens and upper terrace plantings, which integrate the highrise apartment buildings with the earth. Harbour Square remains among the most important residential works in the distinguished portfolios of these two famous architects.